Selection Sunday is here, and it looks like six teams are battling for three spots in the field. Who is in and who is out for the 2016 NCAA tournament? Selection Sunday has arrived, meaning we will soon see the official 2016 NCAA tournament bracket. In the estimation of the SI.com Bubble Watch, we have six teams fighting for three spots. The lucky—or unlucky, as the case will be for three of them—six? Syracuse, Vanderbilt, St. Bonaventure, Monmouth, Tulsa and South Carolina. All of them are done playing for the week, meaning their fate is now in the Selection Committee’s hands. VCU has likely played its way into the field, and teams like Connecticut, Cincinnati and Michigan aren’t yet feeling safe, but we think the résumés say those are the final six teams that could go either way. Michigan: The Wolverines got the win they needed on Friday by upsetting Indiana in the Big Ten quarterfinals. Then they got the help they may have needed when teams like South Carolina and St. Bonaventure went down. The Wolverines should be good, even after losing to Purdue on Saturday. 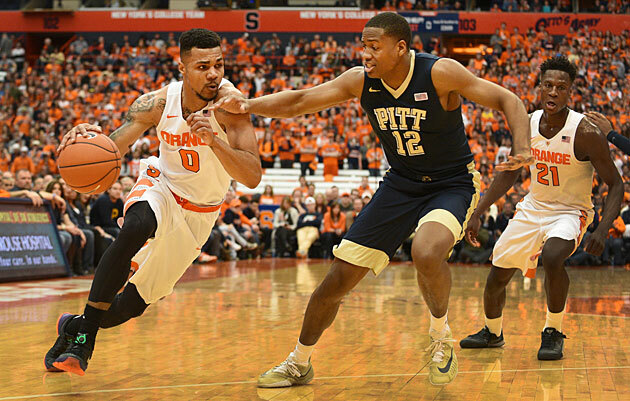 Syracuse: The Orange have bounced in and out of the field since losing to Pittsburgh. Those same losses that helped the Wolverines also got the Orange back into the field. Wins over Duke and Notre Dame have them well-positioned going into Selection Sunday. Vanderbilt: Despite a terrible loss to Tennessee on Thursday, Vanderbilt has a better résumé, in the eyes of the SI.com Bubble Watch, than St. Bonaventure, Tulsa and South Carolina after their respective bad losses. That should be good enough to go to Dayton this week. St. Bonaventure: The Bonnies let a late lead over Davidson in the Atlantic 10 quarterfinals slip away, putting their tournament hopes in serious jeopardy. Working for them, however, is a strong RPI, three wins over at-large teams, and a 6–4 record against the top 100. Monmouth: The Hawks are right on the precipice, and could very well be on the right side of the bubble. Still, it’s hard to overcome three sub-200 losses, even with a couple of good wins over Notre Dame and USC. Tulsa: The Golden Hurricane suffered a terrible loss to Memphis, their third outside the top 140 in RPI. They needed to do some work in the AAC tournament, and instead lost to a bad team by 22 points. That adds up to a trip to the NIT. South Carolina: What happened to the Gamecocks? A team that appeared so safe a month ago lost four of its last seven games, including bad ones to Missouri and Mississippi State. After their third loss to Georgia of the season, they’re going to be sweating until Selection Sunday. San Diego State: The Aztecs cost themselves a spot on the field by losing to Fresno State in the Mountain away championship. They have one great win over California, but they also lost to Grand Canyon, San Diego, Boise State, and Fresno twice. That's not an at-large worthy résumé. NOTE: All statistics are through Saturday, March 12. The Crimson Tide gave themselves a chance to play their way into the NCAA tournament, but Kentucky handled them with relative ease in the SEC quarterfinals on Friday. They once appeared to be in good position, but losing four of their last five regular season games was a bad look, Wins over Notre Dame, South Carolina and Texas A&M, three teams that have already put on their dancing shoes, are unlikely to save the Tide. Path to the tournament: Alabama did a great job putting together a challenging nonconference schedule, and it played well before the conference season. The committee will like that, but there are likely still too many warts on their résumé for them to get an at-large invite. The Bulldogs did significant work to end the regular season, picking up a road win at Georgetown and a home victory over Seton Hall to put them in a very good position heading into the Big East tournament. Their underwhelming RPI rank and strength of schedule won’t leave them much wiggle room, but they should be set for a bid, even though they lost to Providence on Thursday. Remember, the committee has to fill 36 at-large spots no matter what. It’s hard to find 37 more deserving teams than this one. Path to the tournament: Beating the Friars would have locked the Bulldogs into the dance, but they should still be good to go. It took four overtimes to decide, but Cincinnati left its fate in the committee’s hands after losing a thriller to Connecticut in the AAC quarterfinals. The game definitely had the feel of a play-in game, though Cincinnati could better afford a loss. The Bearcats head into Selection Sunday 1–3 against the RPI top 25, 2–4 against the top 50 and 7–9 against the top 100. They also have one loss outside the top 100, making them one of the hardest calls on this season’s bubble. Path to the tournament: Cincinnati joins the many teams cheering against every bubble team still alive in its conference tournament, though its standing improved with losses by St. Bonaventure and South Carolina. Path to the tournament: The Huskies removed all doubt surrounding their at-large status by beating Temple on Saturday. They’re in, no matter what happens on Sunday. The Gators have better metrics than a handful of the teams we have in the dance, but that’s not going to obscure the fact that they’re now 2-10 against the top 50 after losing to Texas A&M in the SEC quarterfinals. Basically, all Florida has proved this season is that it can lose consistently to tournament-quality competition. Sure, that same fate could have befallen a team like Cincinnati or St. Bonaventure if it played the Gators' schedule, but Florida had plenty of chances to prove it belonged in the field of 68 and didn't take advantage of it. Path to the tournament: Realistically, the Gators needed to beat the Aggies, at the very least, to have a chance for an at-large bid. The committee always seems to deliver one surprise every year, and Florida has the requisite strength of schedule to be that team, but it shouldn't hold its collective breath. The Colonials let a 14-point halftime lead against Saint Joseph’s slip away, ultimately losing 86-80 in the A-10 quarterfinals. Had they won that game, they might have been just one victory away from forcing their way into the field. Instead, they’ll likely have to settle for the NIT. They have one great win, over Virginia, and a good one, over Seton Hall. They also won at VCU, but they have just one more top-100 win and will have a hard time explaining away away terrible losses to DePaul and Saint Louis. Path to the tournament: The Colonials will likely be one of the first four or six teams out of the Big dance, but out is out, regardless of where you are in that pecking order. The Bulldogs played one of their best games of the season against Kentucky on Saturday, but things took a turn when J.J. Frazier suffered his ankle injury. Kentucky wrested control at that point, and the Bulldogs were never able to get it back. That was a win they desperately needed to have any realistic at-large hopes. Path to the tournament: The Bulldogs are going to be a dangerous team in the NIT, but, unless the committee shocks, us, they won’t be in the Big Dance. It’s a minor miracle that coach Kelvin Sampson had the unheralded Cougars in the at-large discussion at all. Unfortunately, despite beating all four of the other potential at-large teams in the AAC, as well as SMU, they’re no longer in that discussion after losing to Tulane on Friday. Path to the tournament: The future in Houston appears bright, but it doesn’t include an NCAA tourney berth this season. 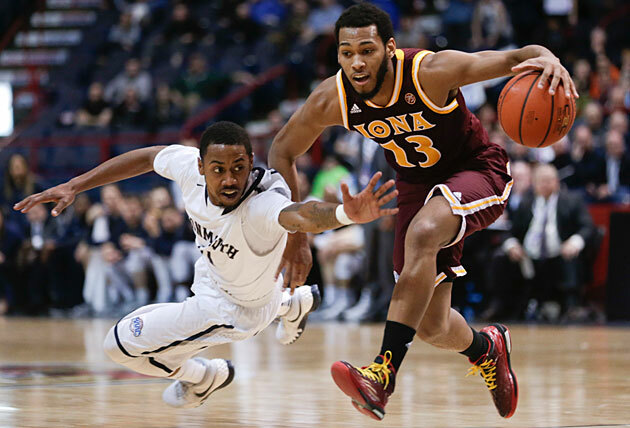 An NCAA bid may be out of reach for Je'lon Hornbeak and Monmouth after the Hawks lost to Iona in the MAAC title game. The Tigers needed to do a ton of work in the SEC tournament after losing six games to sub-100 RPI teams. It didn’t do that, losing to Texas A&M by 33 points in the semifinals. LSU does have three eye-opening wins against Kentucky, Texas A&M and Vanderbilt, but that’s not going to offset all the losing they did during the regular season. Path to the tournament: Unless Ben Simmons shocks the world and returns to college next year, we will never see him in the NCAA tournament. The Tigers aren’t getting there this year. The SI.com Bracket Watch was on a bit of an island with the Wolverines compared to other bracket projections, but that changed after they upset the Hoosiers in the Big Ten quarterfinals on Friday. The Wolverines lost by 17 to Purdue in the semifinals, but they should hear their name called on Selection Sunday. This team has four top-25 wins, adding Indiana to Texas (on a neutral floor), Maryland and Purdue. Michigan doesn't have a bad loss to its name, with the worst one coming at Ohio State, a team that is 71st in the RPI. There’s just no way to say that the Wolverines' resume is not among the 36 best in the country. Path to the tournament: They’re likely in the field, but the Wolverines will still be nervous all day. The arguments for and against the Hawks are clear: They did great work considering the challenges facing a strong team from a small conference, and notched big victories over Notre Dame and USC (plus wins over UCLA and Georgetown that no longer look as good given the subsequent struggles of the Bruins and Hoyas). They also lost three games to teams outside the top 200 in RPI, which is typically a death knell for any team. If they had the opportunities of, say, Michigan, it’s entirely possible they would have as many good wins as the Wolverines. Unfortunately, King Rice's team didn't get those chances. Path to the tournament: We’ve had Monmouth out all week, but then the entire bubble field imploded on Friday, making the Hawks’ resume look a whole lot better by comparison. The committee showed last year that they value teams taking on non-conference challenges, which Monmouth did. It also led the country with 17 road and neutral wins. That, compared with the struggles of the Hawks' bubble brethren, might ultimately be enough to make them the last team in the field. Getting to 11 wins in the Big Ten used to be enough to just about guarantee a spot in the field of 68. Thanks to the unbalanced schedule, however, that’s no longer the case. The Buckeyes played the top six teams in the conference eight times, going 1-7 in those games. They do own victories over Kentucky and Iowa, but that won’t be enough. Path to the tournament: Ohio State needed two meaningful wins in the Big Ten tournament, but got pounded by Michigan State in the quarterfinals. The Buckeyes will not go dancing this season. Oregon State went right down to the wire with Cal on Thursday before ultimately falling to the Golden Bears. Still, the bet here is the Beavers are going dancing for the first time since 1990. They have played quite well against the best competition they’ve seen this year, and there has been plenty of it, as evidenced by their strength of schedule. They own three top-25 wins and are 5-8 against the top 50. They also did not lose a game against teams ranked lower than 100 in RPI. That’s an impressive resume, especially considering how weak the back end of the at-large field is again this season. Any team that has wins over Oregon, Utah and California, without any bad losses, should go dancing. Path to the tournament: Oregon State has a lot of losses overall, but its good wins prove it belongs in the field of 68. The Panthers were likely playing with house money in the ACC quarterfinals against North Carolina, a game in which they hung tough but ultimately fell by 17 points against the top-seeded Tar Heels. Still, they own wins against Duke and Notre Dame, and have nine top-100 wins. That should be enough. Path to the tournament: Pitt isn't going to get better than a No. 8 or 9 seed, but it will hear its name called on Selection Sunday. Path to the tournament: There isn’t any question about the Hawks. They’ll be in the field of 68. Saint Mary's won two out of three games against Gonzaga this season. Unfortunately, it lost the one that really mattered, falling in the West Coast Conference title game on Tuesday night and failing to secure the league's auto bid. Now the Gaels must play the waiting game, and hope that they did enough during the regular season to earn an at-large spot. They join Wichita State, Monmouth and Valparaiso as mid-major teams that could still realistically hold out hope for an invite. Unfortunately for Saint Mary's, the committee typically isn’t in the business of granting a berth to a club that didn’t beat any at-large teams during the regular season. It’s awfully hard to imagine the Gaels getting in ahead of Wichita State or Monmouth, let alone both. Simply put, the math doesn’t add up to them getting in the dance. Path to the tournament: Cheer against every potential power conference Cinderella and hope that the committee views their RPI rank and their two wins over Gonzaga as enough to warrant an at-large bid. The Bonnies surged into our projected field over the last six weeks of the regular season, winning 10 of their final 11 games, including victories aver Dayton and Saint Joe’s, both on the road. Still, the overall resume was lacking going into the A-10 tournament, and they made things worse by losing to Davidson in the quarterfinals on Friday. We don’t typically see top-30 RPI teams left out of the field, but St. Bonaventure could buck that trend. Path to the tournament: So many bubble teams have gone down early in their conference tournaments, leaving the door open for all of them. The Bonnies do have a strong RPI ranking, as well as three wins against at-large teams. Flip a coin. The Aztecs have been in the field this entire season as the heavy favorite in the Mountain West, but they're entire tournament calculus changed after getting upset by Fresno State in the Mountain West finals. They have just one good win with losses to Grand Canyon, San Diego, Boise State, and Fresno twice. Path to the tournament: The metrics definitely favor the Aztecs, but they just don't have the sort of wins you typically see for an at-large team. That's enough to keep them just out. The Bubble Watch committee is fond of saying that bubble teams have no one to blame but themselves if they don’t get into the Dance, and that sentiment is truer for South Carolina than perhaps any other team this season. The Gamecocks’ nonconference strength of schedule was 300th in the country, something the committee is really going to hold against them. Any power conference team with that albatross around its neck will have to dominate its conference. The Gamecocks, however, have exactly one win over an at-large quality team. That’s a mix that screams NIT. Path to the tournament: South Carolina is yet another example of the softness of the bubble this season. In other, better years, they wouldn’t have a chance for an at-large bid. They’re still breathing, but it’s going to be a nervous weekend. The Orange put themselves in a very tough spot by losing four of their last five games in the regular season, then following that stretch with their third loss of the season to Pittsburgh in their opening ACC tournament game on Wednesday. Even if they do get in they will likely have to go to Dayton for the First Four. Working in Syracuse's favor are four wins against the RPI top 50, two of which were against the top 25 (at Duke, vs. Notre Dame). On the other side of the scale are three sub-100 losses. Path to the tournament: Syracuse got back into the field thanks to losses by South Carolina and St. Bonaventure. Now they have to cheer against potential Cinderellas in the American, Atlantic 10 and SEC. Temple slid down a spot in the rankings after losing to Connecticut in the AAC semifinals on Saturday, but this team shouldn’t be in too much trouble. Temple went 6–1 against Cincinnati, Connecticut, SMU and Tulsa, with sweeps of the Bearcats and Huskies in the regular season. The Owls aren’t going to get any help from their RPI number, which, for all its faults, is still something the committee values. The strength of schedule and kenpom.com numbers won’t help, either. Still, when the committee looks at the AAC teams, it will have a hard time ignoring the fact that Temple really dominated its at-large brethren in the AAC regular season. Path to the tournament: Temple is going to have to sweat until it hears its name called on Sunday, but that moment should eventually happen. Tulsa went into the AAC tournament needing to build its resume to feel good about its at-large candidacy. Instead, it lost to a Memphis team that headed into the AAC quarterfinals with an RPI of 148. That was the Golden Hurricane's second loss to the Tigers this season, and Tulsa also had a terrible non-conference loss against Oral Roberts. The Golden Hurricane are in trouble. Path to the tournament: Even with a lot of its fellow bubble teams going down, Tulsa is now a longshot to make the dance. It started championship week behind most of those teams, and that’s where it remains going into Selection Sunday. Valparaiso isn’t quite in the class of fellow mid-major tourney hopefuls like Monmouth or Wichita State. Unlike the Hawks, the Crusaders didn’t post multiple strong victories, with their best win—the only one against a team with at-large chops—coming at Oregon State. And unlike the Shockers, Valpo didn’t take care of the opponents it was supposed to, losing four times to teams with RPIs of 140 or worse. The Crusaders were undoubtedly the best team in the Horizon League, but their overtime loss to UW-Green Bay in the conference tournament semifinals has them ticketed for the NIT. Path to the tournament: Hope that the Bracket Watch has seriously misjudged the committee’s feelings about the Horizon League. 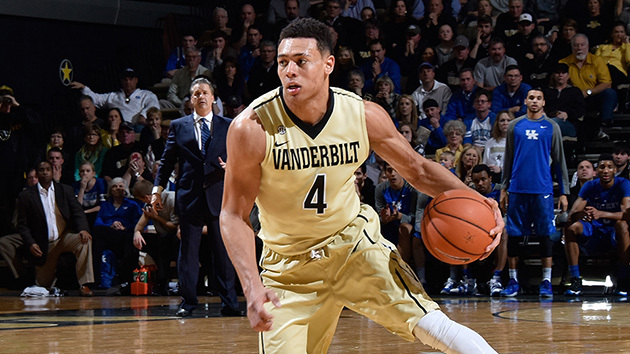 The only thing had the potential to hurt the Commodores in the SEC tournament was a bad loss. That’s exactly what they got when Wade Baldwin’s would-be game-tying layup against Tennessee on Thursday was waved off, sending them home from Nashville without a win. They can boast of victories over Texas A&M and Kentucky, but they also have three losses to teams with RPIs of 118 or worse. They also have just one road win against a top-100 team. We have Vanderbilt in the field for now, but it’s going to be a nervous few days for this team and its fans. Path to the tournament: The Commodores are at the mercy of the selection committee when all they had to do to be safe was beat a now 15-18 Tennessee team. Luckily for them, their fellow bubble contenders fell apart on Friday, allowing them to slide in front of South Carolina and St. Bonaventure to remain in the field. VCU obliterated Davidson on Saturday to move into the Atlantic 10 championship, where it will meet Saint Joe’s. At this point, they’re a lock for the NCAAs. The Rams’ RPI rank is fine, their kenpom.com number is good and their strength of schedule isn’t terrible. They haven’t really added to their resume in the A-10 tournament, but they were right on the cusp of the field heading into this week, and have had their case strengthened simply by avoiding the fate that befell so many of their fellow bubble teams. However, when a team has just two wins against the RPI top 50, both of which were over A-10 bubble teams. Path to the tournament: The Rams entered championship week on shaky footing, but they’ve solidified their at-large candidacy to the point that it won’t matter what they do on Sunday. The Rams will go dancing, either as an at-large team, or the A-10 champion. The Shockers will be, without question, the most interesting—and likely polarizing—bubble team. They may have won the Missouri Valley Conference regular season championship, but neither they, nor the conference as a whole, is as good as in recent seasons. They have one great win, beating Utah back in the middle of December, but that’s their only victory against a team worthy of an at-large bid. They’re just 4-7 against the top 100, with three of those wins coming in the Valley against teams with RPIs of 70 or worse. Yes, they have just one sub-100 loss, but it's not wise to build an at-large candidacy simply on avoiding bad losses. The committee has said it will value metrics other than RPI and strength of schedule this season, so Wichita State's kenpom.com rating should certainly help. Path to the tournament: The Shockers are really going to benefit from a strong non-conference schedule, especially compared with South Carolina, St. Bonaventure and Tulsa, all of which cost themselves a huge opportunity on Friday. Wichita State has actually seen its tournament standing improve since its conference tournament loss to Northern Iowa back on March 5.